I made this card for the Featured Stamper Challenge on Split Coast. After looking through her wonderful gallery I chose this card of Michele's (Chelemom). I really liked the sketch design of this card with the half circle on the side. The changes I made from Micheles card: I used a different stamp set - used a strip of card stock instead of a ribbon and used different colors. 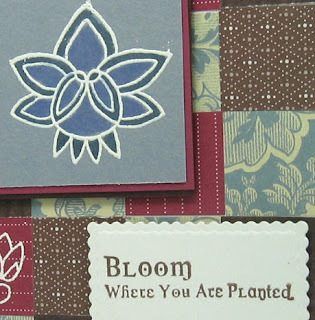 I thought this pretty designer paper by Scrapbour looked similar to the blossom stamp I used. I cut the circle with my Nestabilities and then cut it in half (which I made a 2nd card with!) I colored the blossom and leaf with Prismacolor markers. The flower is from a new stamp set called Bloomin Beauties that will be released by Artful INKables on Tuesday July 1st. 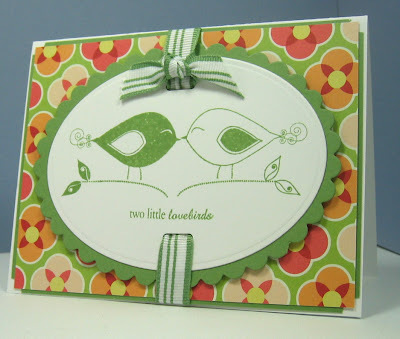 As it happens - Michele used a stamp by Artful INKables on her card also (the cute bird)! And here is a birthday card that I needed for my stash to sell at work. 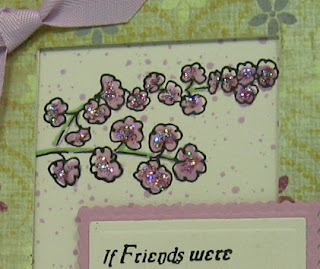 On this card I used a new set from Artful INKables called Pressed Petals. I stamped the blossoms right on the Basic Grey designer paper which I thought looked kind of like a latticework screen that you might place behind your flowers in the garden. I punched the oval on the bottom right corner and stamped the sentiment on the cardstock beneath it. I attached the designer paper layer on top using dimensionals to pop it up a bit. I overstamped the solid color on the blossoms using Color Box chalk ink which is really juicy and stamps nice and dark. The cluster blooms on the bottom were stamped with chalk ink also. You can get this pretty stamp set starting July 1st at Artful INKables. Happy Sunday everyone! I had the best morning attending a workshop on acetate cards run by Lauren Meader at The Papertree stamp shop in Manchester, NH. We made 5 beautiful cards all incorporating acetate in some form. I'm going to load the cards later when I get a chance to photograph them. Here's a shout out to Kathy C, Maddy and Connie who were among those who took the class with me today - I met all three at the last class I took with Lauren at this same shop. Hey Ladies! 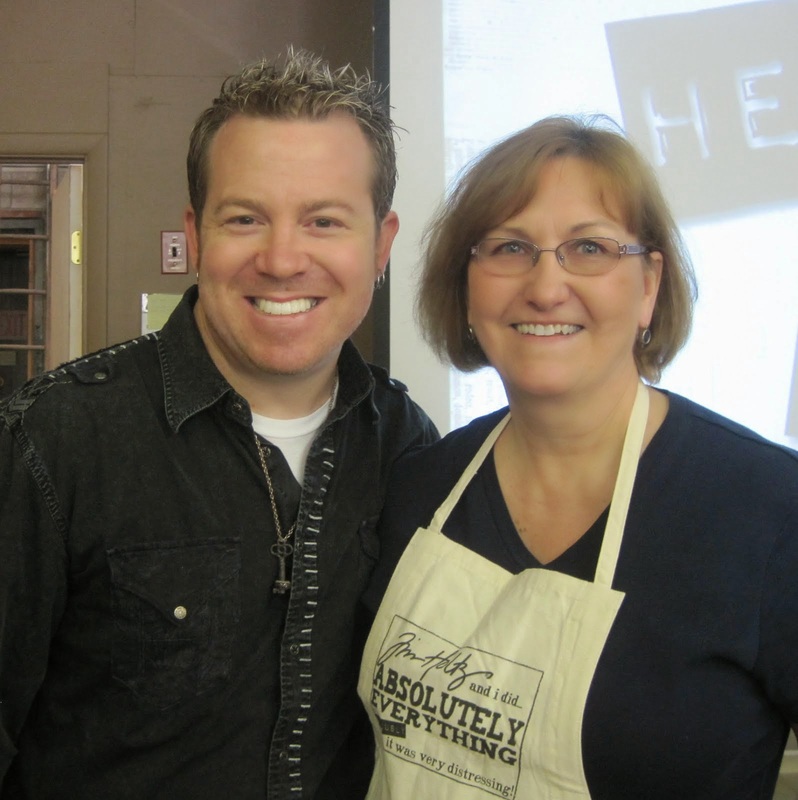 hope to see you again at another class! And some news!!! For any of you that live near Manchester, NH - I'm excited to announce that I will be teaching a class there on making the fun LL Bean-like summer totes on July 27th. So give Michelle a call to reserve a spot and check out her web site under classes - she should have the July listing up soon. I would love to meet you there! Now!! 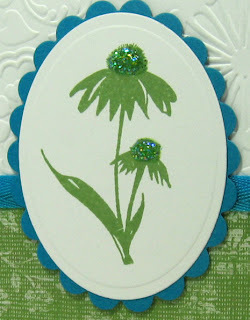 Here is a sneak peak at at two of the lovely flower stamps from Kristin's Pressed Petals set from Artful INKables. One of the stamps is the outline of the flowering branch and the other is the colored flower centers. So it's a two step stamping set. And it was super easy to match the stampings up. I stamped the outline in black first. Then I inked the petal stamp with Lavender Moon by PapertreyInk then rock and rolled it onto Plum Pudding which is a little darker so the petals have a two tone look. Then I added stickles so I sort of lost the two tone look! oh well!!! This pretty frame/card is made using 2 thin 4x4 coasters. The top one is cut with my Cuttlebug and square Nestabilities. Don't use anything but THIN coasters as the Nestabilities won't cut through anything thicker. Amy Rysavy has a wonderful tutorial on how to make these here. Here is a close up of the flower sprig with the stickles. I made the splatter background using a reinker and a toothbrush. (if you use this method - be sure you do it on some newspapers and off your work table!) I outlined the stem with a green marker. And here is a close up of the eisel stand that holds the frame up. You could also attach a magnet so this could be hung on a fridge or cabinet. Thanks for stopping by today - I hope you like this peak of another of Kristin's new stamp sets - check out the other DT members to see which stamps they are using on their projects - just click on their names in the column to the right! The new sets will be available on Tuesday July 1st! Paper: Vintage Cream & Lavender Moon - PapertreyInk, DP: 29th Market St. Polka Spots and Pretty Petal. 2 thin coasters. Supplies: Lavender Moon Twill - PTI, corner punch, strawberry ice stickles, Prismacolor marker - Green tea, petite rectangle nestabilities, square nestabilities, cuttlebug, re-inker, toothbrush. Well, I hope you are as excited as I am to see this great stamp set called Plant Prints from Kristin over at Artful INKables. If you love nature and the woods - you will love this set - It will be available for sale at her on line store on Tuesday - July 1st so be sure to check it out over there! In the meantime - you can see the great sets she has there already! On this project I am highlighting 3 of the sets 8 stamps. A beautiful fern sprig and a pair of leaves - one small, one large. For my project I used a journal that I piked up on sale at an art store - it's about 4 7/8" x 3 1/2". It had a navy cover with some advertising on it - so I needed to cover that up with this great woodsy designer paper by Basic Grey called Mellow Automne. I used my spiral punch to punch on the top edge and it fit right in around the coils! I distressed and sponged the edges before attaching it to the cover. 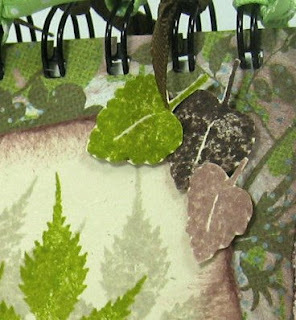 Then I stamped the fern on a piece of Naturals Ivory card stock - first with Lake Mist ink to look like they were in the background and then with Lettuce Ink - both by Adirondack. I distressed the edges and sponged everything with Hazlenut Ink. I stamped the leaves, cut them out, and curled them a little bit around my finger tip. Then I put a foam dimensional in the curve and layered them to the panels. The FABULOUS sentiment is from the Basic Salutations set that has a whopping 18 stamps in it - words and phrases for all occasions!! It will be available on July 1st also. Here's a close up of the cluster of leaves. and here is a closer look at the font on the sentiment - I love the smaller size font on the first word and the mixture of regular and italic letters. To finish off my little notebook - I cut 9 ribbons about 6" long each and double knotted them around the coils - then I trimmed them at an angle to an even length. I also added one knotted piece to the top corner of the panel. I use notebooks like these to write down the recipes for the cards I make - or you could use it for a journal or a too do list. Thanks so much for stopping by - tomorrow I'll have another fun project to share with you so be sure to drop by! Supplies: Edge Distresser - Heidi Swapp, spiral punch: Stampin Up, Dotted green and brown grosgrain ribbons - Michaels, foam dimensionals, sponge. Today I'm showing you a sneak peek of 2 images and the sentiment from a new 8 stamp set from Artful INKables called Bloomin Beauties - and beauties they are! Don't you love the Asian style look to these great blossoms? This set as well as 4 others will be available at Kristin's web store on Tuesday, July 1st. I made this card for the Inspiration challenge on Split coast. Today's inspiration was a wonderful quilt called State Fair Bedding seen here. I was inspired by the color blocks on the quilt as well as the white big blooms on the pillows. I white embossed the blossoms on the main image and on 3 of the quilt squares. Then I colored in the big blossom with my Prismacolor markers. The sentiment frame was cut with my petite rectangle nestability. I love the different font Kristin got on this sentiment - especially the dots inside the O's - just adds that something different to the look! Thanks so much for dropping by! 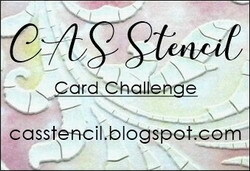 Keep checking back - I'll be loading more sneak peaks of Artful INKable stamps used on some fun crafts! And remember to check out the other Design Team Members - just click their names in the column on the right! Ok, so I decided I'm not waiting until Monday - I'm going to give you all a sneak peek of one of the soon to be released sets from Artful INKables right now! Kristin will have 5 new sets added to her web store on July 1st - so be sure to check it out - that's this coming Tuesday (can you believe it's July already!!??) - in the mean time you can look at her other sets because they are super also! There are some cute fairy stamps for all the little girls in your life and some turtles and fish for the little guys and lots more! But I digress- we're here to see the NEW STUFF right??!!!? So here we go. 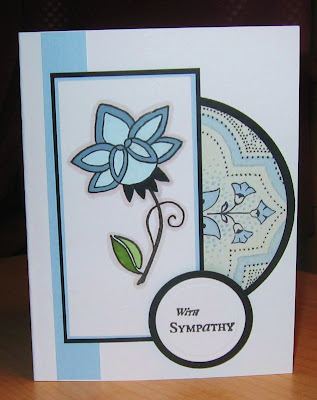 On this card I used 2 stamps of the 6 stamp set called Sunburst Dandies and the 'Feel Better Soon' is from a set called Basic Salutations which includes 18 sentiments! I love the way some of the letters are in italics - it gives it a fun look don't you think? First I stamped the round center that's framed by clusters of dots. 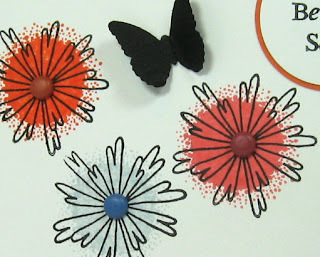 This can be used alone or with the petals stamp as I've done here - over stamping that in black ink. I layered it to coordinating card stock taking the colors from this beautiful designer paper by Cosmo Cricket. I made this card for the Limited Supplies Challenge on Split Coast today - which was to use brads on your image - you couldn't use hardware, ribbons, or primas - but you could use layers. Here is a close up where you can see the starburst stamp better. Isn't that fun?! So tell me what you think about this quick peak into this new stamp set?? Remember to check the other designers sites - I'm not sure if they've gotten their stamp sets yet - but they'll be posting cards as soon as they do! They're listed in the right hand column. My counter hit 20,000 yesterday thanks to you - my wonderful friends here in blog land - I really do appreciate each and every one of you that comes by - I just can't tell you how nice it makes me feel that you like to see what I do here - so I'll be posting some 'thank you' blog candy soon! Keep checking back for more sneak peeks - I have some fun things I'm working on!! Artful INKable Sneak Peeks are Coming!!! Hi Everyone! Happy Friday! the weekend's almost here! Just wanted to let you know that I'm feverishly working on sneak peeks for the new releases from Artful INKables . - I'll be posting projects starting Monday. Wait until you see the great stamp sets Kristin has coming out! In the meantime you can also check out the other Design Team members and see what they are doing - just click on their names in the right hand column and you'll be instantly transported!! LOL!!! But remember to come back here too!! Happy 4th and Warm Winter Wishes! Happy 4th of July everyone (a little early I know!) But Tuesdays Double Dare Challenge that I do with some Split Coast friends was to make a Patriotic card with stripes and stars. Joanne hosted this week. You can see all the Double Dare Cards for this challenge here. I also used the sketch from today's sketch challenge on Split Coast - here is the sketch we had to use. My card is 5 1/2 x 5 1/2 square. The designer paper is Half Way Cafe by Cosmo Cricket. 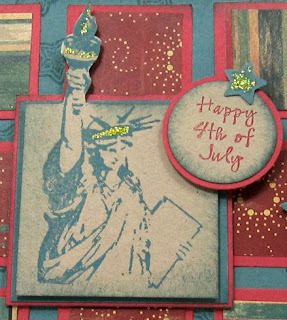 I just love this Statue of Liberty Stamp by Paper Inspirations - I cut around her arm to keep it square in the center like the sketch. My DH said the card looked too dark so I added yellow stickles to the stars, Liberty's flame and head gear. Here is what I stamped on the inside of the card - I also added some punched stars. And now we come to the Warm Winter Wishes part! I made this card for the A-Muse-A-Palooza Challenge 4 - a Sketch challenge seen here. You had to follow the sketch and use at least one Amuse stamp. I used this cute note card by Amuse called Cabana Blue Asterix and both stamps are by Amuse - the Penguin's name is Pete! I scored the rectangle panel to look like the marks in the ice from Pete's skates. I added stickles to the top of his hat as well as the centers of all the snowflakes just to give it a little sparkle. So there you have the hot and cold of it!! Thank you so much for stopping by today! Today's card was created for the Color Combo Challenge on Split Coast. We had to use Wild Wasabi, Taken with Teal and White. I used Julee's Mojo43 sketch . I stamped the silhouette flower from Artful INKables with Wasabi ink on a white Nestability oval and layered it to a Teal scalloped Nestability oval. I used the Floral Fantasy folder with my cuttlebug on the white panel and the bottom is a piece of designer paper from Stampin Up Afternoon Tea. The twill is from JoAnnes and I added Crystal Ice stickles for a little shimmer. Here is a close up of the stickles and pretty bloom. On the inside I cut 2 small strips of the designer paper and attached them to the top and bottom of the card. I stamped the sentiment from PapertreyInk on white card stock and cut and embossed it with my rectangle Nestability. Well I am happy to report that I got my router set up on my computer so that my new laptop is now connected to the internet via a wireless connection (I am SO smart!! LOL!!) At least it seems to be working so I think I did it correctly! Tomorrow I tackle loading Adobe PhotoShop on it and try to learn how to use the software! Just a quick birthday card today. A friend at work requested a card for her Boss's birthday - she wanted it to say Happy Birthday Boss and have cupcakes on it. So this is the design I came up with. The bottom of the cupcake and the tops are separate so you can stamp them in different colors and there are 3 variations of the top as you can see here. You could add some stickles for sparkle - but I just wanted to keep it plain today. I stamped a few of the flags on scraps - cut them out and poppped them up on dimensionals. I love how this banner and flags looks stamped. And I love these 2 Papertrey colors - Berry Sorbet and Sweet Blush. Inside it says - It's your day - Eat Cake! (the boss has a sense of humor - my friend says). The stamps are all PapertreyInk (accept for the Eat Cake inside and that is SU). I just love this banner of flags from the It's a Celebration set. I just bought a laptop computer today so I can blog etc when I go away - so now I have to go figure out how it works! Wish me luck!! Hope you are all having a great weekend - we have had just super summer weather here in New England these past 3 days. And my DH and I celebrated our 11th Anniversary yesterday! I have three cards to share with you today - one for the A-Muse-A-Palooza 'make a card with bling' challenge, a card for today's Featured Stamper on Split Coast and an Artist Trading Card. First up is my Amuse card. This cute striped card is made by Amuse and the stamps I used are from the Clear Nature Set and the Essential Ovals Set. The image and sentiment are up on foam dimensionals. 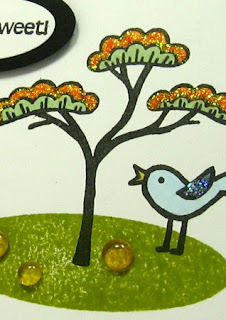 I added orange peel stickles to the trees for my bling as well as Blueberry Ice sticles to the birds wing. I also attached 3 dew drops to the 'lawn' for a little extra sparkle. Be sure to check out the Amuse Blog to see all the fun A-Muse-A-Palooza activities going on - there are prizes to be had! 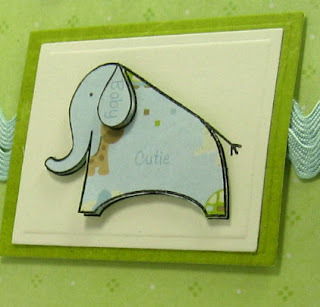 My next card is a CASE (copy and selectively edit) of a card made by Diane - today's Featured Stamper on Split Coast. You can see the card I cased here. 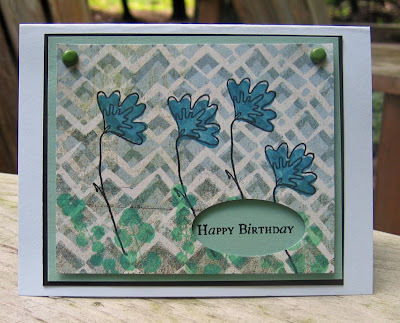 When you case you have to change some things - I changed the colors, made it a rectangle card instead of square, and used different stamps - but I loved the layered flower and sketch so used those ideas on my card today. I made my flower by layering scalloped nestability circles. I sponged the edges and cut in on the sides of each scallop then ruffled the 'petals'. I layered one on to the other with foam dimensionals. Lately, I've started to stamp a little something on the inside of my cards along with whatever sentiment I put in there. I like the little added interest it gives to the inside of the card. Here's what I stamped on this card. This card also qualifies for the Pretty in Pink challenge over on Caardvarks - to make a card using pink! You should check out the Caardvark challenges also - more prizes to be won! Accessories: pink grosgrain ribbons, scalloped circle nestabilities, foam dimensionals, sponge, cuttlebug, swiss dots folder, Prima artful leaves, foam dimensionals, ticket corner punch. And, last but not least, is my little ATC (Artist Trading Card). I make one of these 3 1/2 x 2 1/2 cards each month for a challenge I do with Helen (misshelenstamps)over at Split Coast. Helen hosted this month and the challenge was to use fruit on your card. I used these cute layered stickers that I picked up at Michaels some time ago - a whole sheet of them for $1! The great scalloped lined designer paper is by Narratives. I also added red stickles to give a little bling - the sentiment and stamped blossoms are from PapertreyInk - Green Thumb set. You can see my other ATC's by clicking on ATC in my idex in the right hand coloumn. Oh, my gosh, Oh my gosh, Oh, my gosh, YES!!! --- that's what I said to Kristin when she e-mailed me and said I was one of the ones chosen to be on her design team for Artful INKables and did I wish to accept the position? See her announcement here and also check out all the great stamps she has for you here at Art Inkables. I am so excited and humbled - she said she had over 100 applicants for the 5 positions - I'm still in shock that I am one of the 5!! So - now I'm thrilled to be meeting my fellow Design Team members - Jennifer Maraoka, Kim Teasdale, Christina Fischer and Beth Thomas I can see that I am in very good company with these very artistic ladies - and I will be one busy little camper next week making cards to showcase Kristin's great stamp sets. I can't wait till they arrive in the mail so I can get going! Thank you so much for sharing my great news with me today! I am so appreciative of you all checking out my work - and you know I love checking out yours too! So - stay tuned for some fun stuff coming up next week!!! PS - you can see cards I made using Art Inkables stamps here and here. 1. I love strawberry flavor but won't eat strawberries - because the seeds get stuck in my teeth! 2. The seeds get stuck in my teeth because they are so close together - which is the result of my having braces on those teeth in various stages from age 6 right through college! The orthodontist made them 'too' perfect! 3. I love to travel - but I often get ill when flying on planes because of an inner ear problem that makes my head not know where my body is in space! 4. When I went to summer camp the year I was in 4th grade - I made every single arts and crafts project they offered so my parents had to pay more at the end of my 2 week stay! 5. When my sister and I were little - my father bought adirondack chairs for our back yard in red, green, yellow and blue. He said the red one was mine and the blue one was my sisters - and so from then on my favorite color was always red - but now I'm not sure if it's because I really love red- or just because my father chose that color chair for me!!! 6. I am presently addicted to Star Bucks iced green tea latte with skim milk. 7. And this won't come as a surprise to most of you - I'd rather make a card then go to a movie or go visit a friend - unless I have plenty of time to do both! if it's one or the other - I choose stamping! 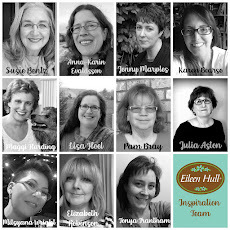 And here are some of my blogging friends that I'm tagging - please check out their fun blogs and say hello to them! I made this card for the Ways to Use It Challenge on Split Coast - to use Ric Rac on your card. I nested 2 rows of ric rac behind my cute little paper pieced elephant which is from the Bitty Baby Blessings set from PapertreyInk. I framed him on Nestability cut and embossed rectangles. I used a Martha Stewart edge punch for the top and bottom 'valences' and mounted them with foam dimensionals. Here is a close up view of the little ellie showing the popped up paper piecing with a second layer for his ear. The way you do this is - first stamp the image on the card stock piece, then stamp it on the designer paper, cut it out and layer it to the card stock image. You can attach it flat or popped up with foam dimensionals - I used dimensionals. I particularly stamped over the words on the designer paper so that 'Baby' was on the ear piece and 'Cutie' was in the center of his body. Inside I stamped "welcome little one" by Savvy Stamps. I'm posting really late tonight so I have to run off to bed - but thank you so much for stopping by! This card is for today's sketch challenge on Split Coast as well as for the A-MUSE-A-PALOOZA out of the box challenge - to use a stamp in an unusual way. I stamped my Amuse golf cart rolled over and teamed it with this sentiment from the Amuse Sushi set. I stamped the flower from the sushi set randomly on the certainly celery panel using Versamark ink so it's just a faint stamping - like a watermark. This is the sketch for today. Inside I stamped 'Tomorrow's forecast: Brighter than today! from Stampin Up Brighter Tomorrow set. I'm thinking I could use this card for someone who was having a rough day and hopefully it would bring a smile to their face! The base card is from a set of printed cards from The Paper Company that I got at Michaels years ago - it was just waiting for me to pull it out today and use it (finally!) I'm trying to go with the Amuse method of keeping it simple so I didn't add any ribbons or framings, buttons or bows! Don't you just love this cute little dog sheriff ?!? It's part of a really fun set from The Cats Pajamas. 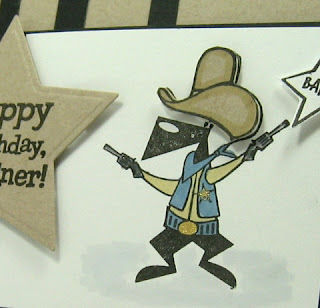 I made this card for the Caardvarks challenge to make a male "Dude" Birthday Card and I used Julee's Mojo Monday sketch. I thought the sketch worked perfectly with the vertical strips looking like prison bars for my sheriff! I stamped his 10 gallon hat on a scrap of white - colored it with my prismacolor markers, cut it out and attached it over the stamped image using foam dimensionals. The stars are up on dimensionals also. I used Spica shimmery gold and silver pens to color the badge, belt buckle and guns. You can see it a little better in this close up. So that's it from me today - thank you so much for coming by! This is my Trifecta card - I made it for 3 different challenges! First - it is the color challenge on Split Coast - to use Kraft, Soft Sky and Basic Black. It also is the Saturday Sketch Challenge over at Our Creative Corner. 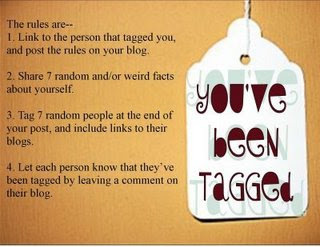 And number 3 - it is for the weekly Double Dare Challenge I do with a small group of SCS friends. That challenge was hosted by Joan Ervin this week and her instructions were to make a summer card using flowers and birds. You can see all the Double Dare challenge cards here. I don't usually like combining challenges like that as I get so focussed on the rules of each one I lose my creativity (Stef was just talking about that on her blog today) But I had the vision of what I wanted to do with this and it all came together for me today! The black panel is dry embossed with the distressed stripes Cuttlebug folder but you can't see it too well. The flowers are Stampin Up rub ons. The bird is from Amuse and the sentiment is Stampin Up - and they are up on foam dimensionals. I punched the scallop edge with my corner rounder with the guide piece taken off. I made the inside sentiment on my computer - printed it out and punched it with my scallop punch. 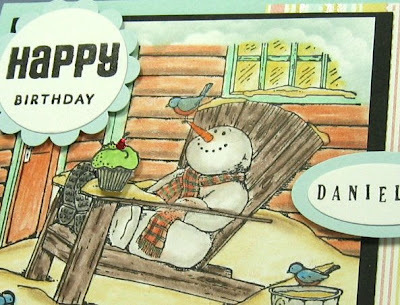 And here is another Snowman card that I made for my friend at work who sends them to her friend in Florida. This is for Danielle's June birthday - so it is a beach snowman! I colored the image with my new Koh-I-Noor woodless colour pencils and gamsol. The pretty designer paper is for Peeps Sake by Imaginese and has a shimmer to it. The Happy Birthday is by Verve Visual and the name is done with Karen Foster Snap Stamps. I stamped a cupcake by Lockhart Stamps - cut it out and layered it on the arm of the chair with foam dimensionals. I added red stickles on the cherry. I stamped a Birthday verse from PapertreyInk and a pile of snowballs by Stamps By Judith on the inside. You can see all my snowman cards by clicking on Snowmen in the index on the right column. Thank you for stopping by today! I'd love to have you leave a comment for me! at once! This first card was made for the Featured Stamper on SCS - who was Denise (Denidill). 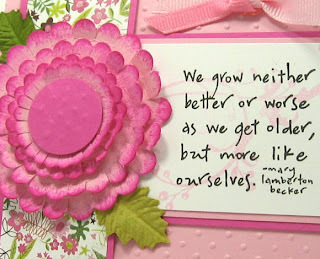 She has a lot of wonderful cards to inspire and I chose this one today. I love the scored top on this and have been wanting to make a card using this design. I also needed some wedding cards for my stash. I changed the colors, the stamps used and didn't add buttons. 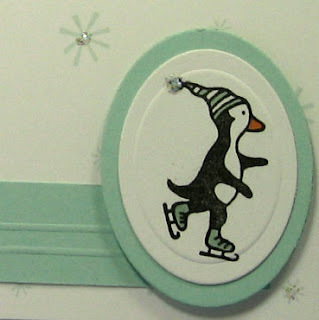 I love this shimmery DP from Reminisce and I teamed it up with Shimmery White from Stampin Up. The papers have a beautiful shimmer in real life but it doesn't show well in the photo here. I used my nestability rectangles to punch and emboss. This wonderful bride and groom stamp is from Artful Inkables and the sentiment is from PapertreyInk. Inside I stamped 'always and forever' from the same PTI Wedding Day set. My husband said I shouldn't have used black ribbon on this card - I told him black is used for weddings now - what do you think?? I made this card for a friend at work who asked me to make a wedding shower card with Wasabi green. I had this fun designer paper from SEI that matched the Wasabi card stock and this cute stamp set from Verve Visual. The Nestability ovals are punched and embossed and attached with foam dimensionals. I used my horizontal slot punch from Stampin Up to punch the openings to weave my ribbon through. Inside I personalized the card using my Just Rite Monogram stamper and the sentiment from the Verve Visual Set. Accessories: Striped grosgrain ribbon: SU, petite ovals nestabilities, circle nestabilities, horizontal slot punch - SU, foam dimensionals, ticket corner punch. My last card for today was Saturday's Inspiration challenge on Split Coast. Stef showed us some images from an Acacia Catalogue and I chose this image for inspiration. A clear vase with flowers on the front and colored circles on the back. I used acetate for the card to represent the clear vase. I stamped the flower silhouettes from Artful Inkables on the front using Stazon On White ink and then colored them a bit with my Stampin Up Markers. On the inside I attached 1 inch punched circles of this beautiful Amy Butler Mat pack from K & Company. I stamped 'Love Blooms' from PapertreyInk Favor It Wedding set on the bottom right circle. The DP is double sided so I didn't have to cover the back as the pretty colors on the other side show. Acetate is kind of hard to work with - EVERYTHING sticks to or smears on it! And it's very difficult to photograph - I hope you can see the inspiration piece in this card. So that's it for now! If you made it this far - thank you SO MUCH for stopping by and taking a look! 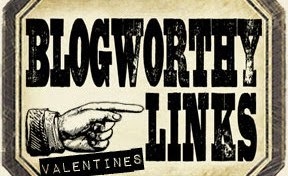 Leave a comment so I can visit you on your blog too! 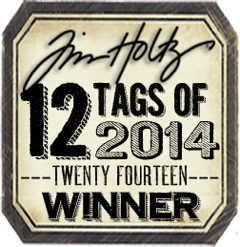 I've Been Tagged for Questioning!